Internet and technology have affected every part of human life. The same is true for the business world. The transaction methods have evolved with time. Physical shops have moved to the online space. And there have been many other changes too. Just like any different domain, these changes have also impacted the hospitality and hotel industry. All industries must catch pace with the technological advancements to stay competitive in the market. Failing which, as the owner of a business you will lag in the rat-race of competitors. As mentioned earlier, the payment system has also transformed. It started with the barter system, and in the present time, electronic and mobile payment systems are in place. As the owner of a hotel, to keep your business up to date, you must follow the below things regarding Hotel Payment System. If you do so, you will also be able to improve your bottom line. Alipay is a digital payment platform that took birth in China. At present, it supports approximately 17 to 20 international currencies. When we talk about security and credibility, it is a very robust digital monetary trade system. Alipay in association with electronic security certificate encrypts the data and prevents theft of sensitive information. It also assigns two highly protected and regulated passwords to the users – Login Password and Transaction Password. Because of these reasons Alipay is continually gaining popularity throughout the globe. You can use it to make payments in-store, through mobile, tablets, and personal computers. WeChat is a mobile-based application that originated in China. This application is spanning its wings worldwide and supports approximately 8 to 10 major currencies because of its highly secured nature. Just like Alipay, WeChat Pay also has robust data encryption and password system in place. It is a powerful application that acts as a social media platform, helps you in sending messages, and making online payments. It also supports video call and conferencing. WeChat can integrate with other social media platforms as well. 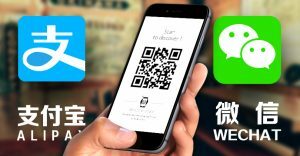 The e-wallet embedded within the WeChat application is called WeChat Pay. Like any other e-wallet, you can use it to transfer money to someone, buy movie tickets, pay for your cab, buy train or flight tickets, perform online or in-store purchases, invest your funds, and much more. These two electronic payment options are gaining popularity across the globe. They can be used as Hotel Payment Methods too. Today, the customers demand ease, credibility and, security. These two payment options fulfil all these requirements, and if you incorporate them in your business, your customer base is sure to expand. Most of the world’s population can afford mobile phones today, and people have already established their faith in the electronic and mobile payment systems. Both national and international tourists visit a hotel. It is imperative to accept payment in all currencies to help the customers a comfortable stay. If this aspect is taken care of, you will see accelerated growth in your customer base. Dynamic Currency Conversion comes into play when we go to a foreign country and try to use the Visa or Master card issued in our own country. In this procedure, you can convert the transaction amount to the currency of your own country at the point of sale. Both merchants and Automatic Teller Machines can have this system installed at their point of purchase. There is some markup fee that the customer must pay, but it is usually less than the currency conversion fee. PMS or a Property Management System is common in real estate, hospitality, logistics, manufacturing, and any other government organisations. It is a software that aids in managing the entire property including maintenance, equipment, finances, legalities, and personnel. Previously, the same thing was done using pen and paper. With the advancement of technology, automation and systems came into place. Nowadays, it is usually a cloud-based technology. When you install PMS in your hotel, it acts as a central point of control for all the departments. It has multiple interfaces that correspond to each of the departments, and there is a crisp and clear communication between these departments and the central Property Management system. Some of the interfaces of PMS in the hotel industry are Accounting Systems, Marketing Systems, Security Systems, Self-Check-in and Check-out Terminals, Point of Sale Systems, Entertainment, Energy, Personnel, Hotel Payment Gateway, and many other systems.Many benefits are evident once payments and your PMS has been integrated. When customers check-in in a hotel or resort, they use other amenities that are available like the restaurant or the spa. It becomes convenient for guests if they can pay all at once for the used facilities of the hotel. PMS and POS are integrated, the POS keeps communicating with the PMS about the status of each guest and the charges that must be paid by the guest while check-out. It is vital for a hotel industry to increase its customer base and operate profitably. It is another essential practice that a hotel industry must follow. It ensures that customers will pay for the services they are using. Once you install Pre-Authorization software in your hotel, you can link it to the Hotel Payment Processing gateway. This can also be done through specialized EFTPOS Terminals. When a customer checks in or books the hotel, based on the booking cost, the system puts a certain amount hold. The customer cannot use that amount until he or she makes the complete payment. It is one of the other features that are crucial for the sustenance of a hotel. The customers must have the option to pay for services in the room. For example, if you want to watch a movie while in a hotel, you should have an in-room facility to pay for the film and subsequently view it. The same thing applies to a mini-bar available in the room. It will also reduce the manual effort of checking the items. It will also add to customers’ delight by adding more transparency to the service. The hotel industry must keep pace with the current technological developments to enhance customer delight and increase profitability. Many vendors are selling Hotel Payments solutions. One of the known firms in this domain in Australia is Safe2Pay. As a player in the hotel industry, you must choose your options carefully and stay competitive in the market.